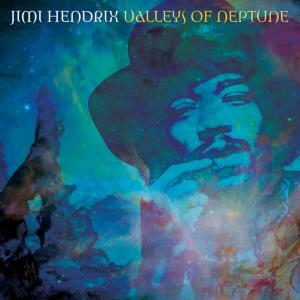 Jimi Hendrix - "Valleys of Neptune"
Experience Hendrix have just put out this new double vinyl record of more Hendrix outtakes. While the sticker hypes this as a brand new unreleased studio album, it is in reality just recordings of a lot of songs that the fans have already heard, just not these exact versions. It is a little misleading to call this a unreleased studio record as nearly everyone has heard the songs Stone Free, Red House, Fire, Hear my Train a Comin', Lover Man, and Sunshine of your Love. Like I said, just not these exact versions. The really new stuff that I was not familiar with were tracks like Valleys of Neptune, Lullaby for the Summer and Mr. Bad Luck. While some of these tracks and versions are really cool, quite a few of them really come across as just demos and not finished tracks. Certainly, Jimi never would have released these versions as most are live in the studio takes with no overdubs. It is still pretty cool and I really like the reworked version of Stone Free and the totally killer version of Hear my train a Comin'. Nice double vinyl with a big booklet, colour photos and great sound.